8. My middle child has turned eight years old. Beautiful, blue-eyed Gracie came into this world on April 14, 2010 and forever filled our hearts with love and joy. How is my first baby girl 8 years old? You know that feeling you get on your kids birthdays when you realize they are another year older and for a moment you tear up (happy tears) thinking how fast time has gone by and how proud you are of the person they have become? Well I have that feeling except it is coupled with an unimaginable pain. I start off with those happy tears and they suddenly turn to fearful, worrisome, sad tears. Why? The answer is plain and simple. I miss my girl. I wonder where she is. I wonder if they celebrate birthdays in heaven. I wonder what she would look like and what she would want for her 8th birthday. I thought that as the years would pass and each birthday came it would get a little easier, but it doesn’t. It stings just a little bit more each passing year as I face the hard reality that I know nothing about my 8 year old daughter. I only know her as an almost 2 year old. I know there is absolutely nothing I can do about this (a tough pill for a parent to swallow), except imagine. So imagine is what I do. I am lucky enough to work in an environment where I’m surrounded by kids’ Gracie’s age all day long! Every once in a while I realize this and I sit back for a minute and watch and listen to what they are “into” and think about what Gracie would be doing if she were here with us. Gracie would be in second grade, she would be reading chapter books, writing notes to her friends, finding a small space to buddy read with her friends. She would most likely want to wear Justice clothes, play with jewelry, fingerlings, mermaids, legos, or LOL surprise dolls. She might be playing soccer or softball, or maybe take a gymnastics or dance class. The list is endless! I know she wouldn’t be doing all those things, but all I have left is to imagine what she would be doing as she turns 8 years old. I only wish she was here to show me exactly what she was interested in, what makes her happy, what makes her sad and what makes her Gracie. As I said before I know there is nothing I can do about how much I miss Gracie and how much I want her back. But I can do something in her honor and memory. So that is exactly what I did! 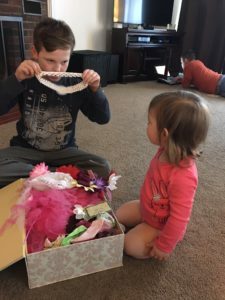 Gracie has a box of tutus and bows that has been up on a shelf in a closet since she passed away. I have looked at that box many times and thought about giving it to a local photographer for props or sending it to Goodwill, but I never did. It never felt right. Maybe it was Gracie telling me to hold on to it for this very moment. 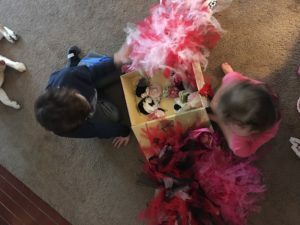 I decided this past week to take that box down and have a tutu birthday celebration in Gracie’s memory because we now have another little girl that I’m sure would have loved to get into her sisters belongings if she were still here. So we took that box down, remembered Gracie in those items and let Ava play with her sister’s hand me downs. Big brother Luke made fun of the girly items and entertained us all by being silly with them. But he also really looked at some of the items and remembered pictures with his sister at Christmas in the red tutu. Ava is now Gracie’s age (before she passed) so she was thrilled to get into the box of dress up! Ava is also about to surpass Gracie’s time here on earth, but that’s a whole other emotion to tackle on another day. 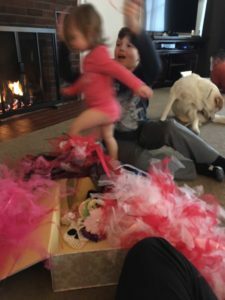 This was good for all of us and may be our new tradition on Gracie’s birthday as we try to celebrate the day she was born, remember her, explain to her sister who she was and as a family imagine what she would look like and who and what she would be. We also carried on our tradition of cooking dinner at the house that love built, The Ronald McDonald House of Albany. The RMH was such a big part of our lives as Gracie fought cancer. They gave us shelter, food, support and love. Since we can’t give that to Gracie, it’s only right that on her birthday we share these things with others who are in the same situation we once were. As always the RMH puts a smile on my face and more love in my heart. Happy Birthday in Heaven. Together in the same old way would be my dearest wish today. Happy 8th birthday, my Gracie Girl. I love you to the moon and back. ← Once Upon A Time…. My God, tearing up as I read this.. definitely needed this as I listen to both of my children screaming in the other room.. this is a good reminder to celebrate it all.. the happy, sad and very tough moments of parenthood.. Thinking of you Lisa and family.. she is with always..
That was the best thing that I have ever read. Happy Birthday Gracie. You are loved and missed. You are with Grandpa now so give him a kiss for us. Miss you both.